Without question the single most important piece of hardware for digital imaging is the quality of colour and detail on a monitor display. 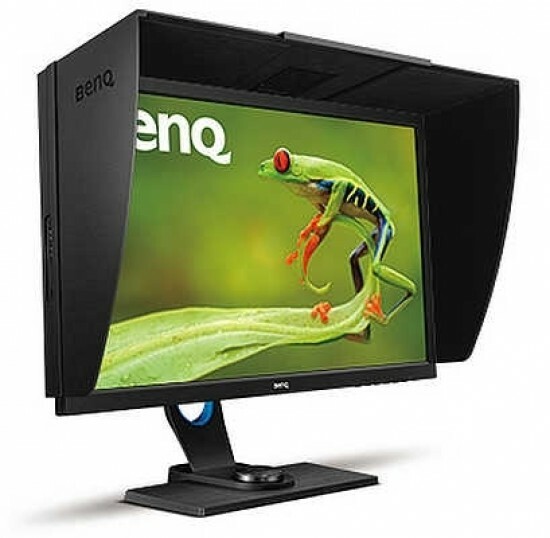 In this review we are taking a look at the new BenQ SW2700PT 27-inch LCD monitor, which retails for £499 / $650. The BenQ SW2700PT is supplied in a flat pack box, you must assemble the base and vertical stand. Attach the vertical arm to the base unit and tighten the lock key. Attach the vertical support to the rear of the screen which clicks into place. Next assemble the five section monitor hood, this was the most awkward part of setting up, be patient with it. The vertical arm has a generous amount of movement up and down and swivel, you will find the ideal viewing angle for yourself very quickly. The rear vertical support has convenient markings. The power and connection ports are all located at the rear under a ledge, which makes them awkward to access. Fortunately the monitor can be swivelled to a 90' upright position, the ports are now easier to access. The ports include; AC power input, On-Screen-Display (OSD) controller socket, 3.5mm headphone jack, DVI-D socket, HDMI socket, DisplayPort socket and USB 3.0 port (for upstream connection to a PC). Located at the side of the monitor are two USB ports (downstream), this transforms the monitor a virtual USB hub, and a SD memory card slot. The USB ports are a useful addition as this allows for easy connection of a profiling device (spectrophotometer) or other devices. The SD memory card slot enables you to download digital files directly to the computer, but not for displaying images directly onto the screen. Connect the Power, DVI-DL cable, USB and the On-Screen-Display (OSD) controller and you are ready to get started. On first power-up I was taken back at the high quality of the large 27in display (2560 x 1440 pixels), the aspect ratio is 16:9 with a contrast range of 1000:1 and displaying 1.07 billion colours. Digital images and videos look impressive without making any adjustments at this stage. But to get the very best results from this or any monitor you must calibrate and profile it first. 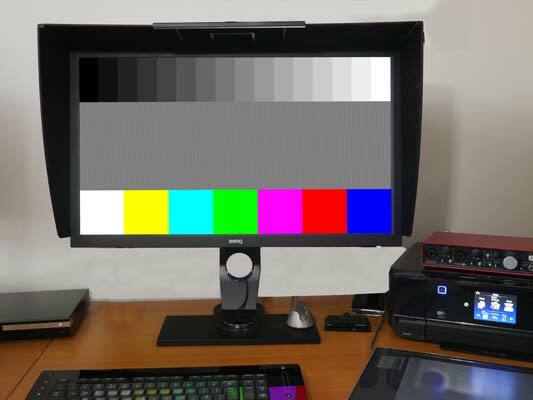 The BenQ SW2700PT monitor comes with profiling software called Palette Master Element. This software supports the following devices; X-Rite i1Pro, i1Pro2, i1Display Pro, i1Display 2 and Datacolor Spyder4 & Spyder5. The Color Munki is not supported at the time of writing. 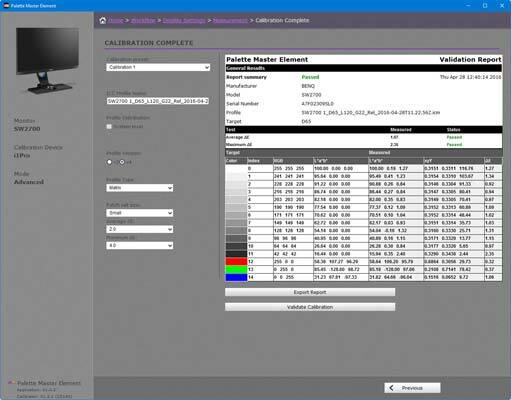 The Palette Master application was not included on the installation CD, we downloaded it from the BenQ web site. The software will look for a supported device and also confirms that a BenQ monitor is connected (it will not work with other monitors - I tried it).